Farshid Moussavi is an architect and educator, and principal of Farshid Moussavi Architecture (FMA). 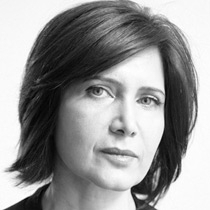 She studied at University College London and Harvard Graduate School of Design before co-founding Foreign Office Architects (FOA) in London, recognized as one of the world’s most creative design firms, integrating architecture, urban design, and landscape architecture in a wide range of projects internationally. FMA has recently completed the Museum of Contemporary Art in Cleveland and is currently working on a variety of other prestigious international projects, including a residential complex in the La Défense financial district in Paris. The firm recently completed an installation for the 2012 Venice Architecture Biennale. At FOA, Moussavi co-authored many award-winning projects internationally including: in Japan, the Yokohama International Cruise Terminal and the Spanish Pavilion at the Aichi International Expo; in the UK, the John Lewis Department Store and Cineplex in Leicester and Ravensbourne College of Design and Communication in London; in Spain, the South-East Coastal Park in Barcelona, the Municipal Theatre and Auditorium in Torrevieja, and the Carabanchel Social Housing in Madid; and in Turkey, the Meydan Retail Complex in Istanbul. The work of FOA has been widely published and exhibited, most notably as a solo show representing the British Pavilion at the 8th Venice Architecture Biennale in 2002. The firm has received many international awards such as the Enric Miralles Prize for Architecture, six RIBA Awards, the 2004 Venice Architecture Biennale Award, and the Charles Jencks Award for Architecture. Since 2006, Farshid Moussavi has been Professor in Practice of Architecture at Harvard Graduate School of Design. She has previously taught at the Academy of Fine Arts in Vienna, the Architectural Association in London, the Berlage Institute in Rotterdam, the Hoger Architectuur Instituut in Gent, and in the U.S. at Harvard Graduate School of Design, Columbia University Graduate School of Architecture, Planning and Preservation, and Princeton University School of Architecture, as well as at the UCLA School of the Arts and Architecture. Farshid Moussavi is the author of The Function of Ornament (2006) and The Function of Form (2009), based on her research and teaching at Harvard. Both books have been translated into several languages. She has recently become a regular columnist for The Architectural Review. Professor Moussavi serves on design and architecture advisory groups internationally. She is a member of the Board of Trustees of the Whitechapel Gallery as well as the Architecture Foundation in London. Previously she served as an External Examiner at the Royal College of Art in London, a member of the Advisory Group to the British Council, and on the Mayor of London’s Design for London advisory group, the International Design Committee for the London Development Agency (LDA), and RIBA President’s Medals. She has been a member of the jury for the RIBA Gold Medal and the Stirling Prize for Architecture. In 2004, she was Chair of the Aga Khan Award Master Jury and has been a member of the Award's Steering Committee since 2005.